California, Florida, Nevada, Texas and New York are (in that order) the most visited states in America, according to recent hotel bookings. Partly because those states are brimming with people. But also because they’re known for having lots of cool things to do. But what about states at the opposite end of the popularity spectrum? The ones that, for whatever reason, don’t get as much love as their contemporaries? To answer that, here are five less trendy states that are high on adventure and rate well among the relative few that visit them. Although more recently known for its dimming industrial star (i.e., Detroit) than its statewide beauty, Michigan is an excellent choice for the big outdoors. In addition to the Great ones, it has 12,000 lakes, more coastline than any state but Alaska, famous scenic drives and several national parks and landmarks. Highlights include Mackinac Island, Pictured Rocks Lakeshore, Porcupine Mountains State Park, Pierce Stocking Scenic Drive and the whole Upper Peninsula. Dubbed “The Natural State” for its wilderness, Arkansas features the soft-rolling Ozark Mountains to the northwest and slow-moving Mississippi River to the east. 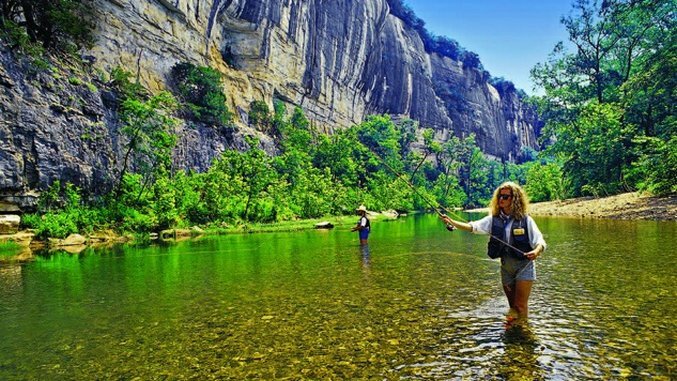 Popular attractions include Hot Springs National Park (often ranked in the top 20 for its Bathhouse Row), floating or fishing Buffalo National River (pictured) and the caverns at Devil’s Den. But Arkansas is more than just backcountry. The city of Bentonville is unexpectedly hip. Coming from someone who spent his childhood in Oklahoma, I realize it’s hard to get excited about visiting a place that’s so flat. But exit off the—yes, flat—Interstate 80, and Nebraska is less monotonous and more handsome. Notable features include Scotts Bluff National Monument, the sunken gardens and state capitol in Lincoln, Chimney Rock, Henry Doorly Zoo and delightfully polite people. If you’ve ever seen Dan In Real Life (2007; 4/5 stars) starring Steve Carell, you’ve already caught a glimpse of the Ocean State’s aesthetic quality. Nestled between Massachusetts and Connecticut and the smallest state in the union, Rhode Island punches well above its weight. Block Island, Mohegan Bluffs and Colt State Park are all standouts. But Newport’s historic mansions, Ocean Drive, summer polo matches, Marble House and Cliff Walk are bygone remarkable. Second only to West Virginia for fewest number of visitors, Wyoming rivals the nearby states of Arizona, Utah, Colorado and even California for “best looking” honors. Let us count the ways: Yellowstone National Park, Grand Teton National Park, Jackson Hole, Devil’s Tower, Grand Canyon of the Yellowstone and the haunting Black Hills are all here. If Wyoming had a major airport, I guarantee its visitors would quadruple—it’s that pretty.